Search.seasytowatchtv2.com is the PUP that uses misleading techniques to prevent removal. Use Reimage to locate malicious components and get rid of them faster than with uninstall instructions. A full system scan blocks virus reappearance and prevents traffic to malicious domains. Search.seasytowatchtv2.com is a misleading search engine that belongs to the infamous Polarity Technologies Ltd (“Polarity”). This company is considered to be a malware developer as most of its apps are distributed bundled with freeware and programmed to modify web browser's settings severely. Search.seasytowatchtv2.com is also that kind. If the user agrees to install it, it alters browser's start page, search provider, new tab URL, and injects tracking cookies. Such and similar changes are crucial for the implementation of affiliate marketing. Web browsers targeted Google Chrome, Mozilla Firefox, Internet Explorer, Microsoft Edge, Safari, Opera, etc. Elimination To restore previous web browser's settings, install Reimage and eliminate PUPs from the system and then reset web browser's settings. Prevents PC's user from Search.seasytowatchtv2.com removal; Reassigns itself as soon as a web browser is restarted. The Software may contain certain Third-Party components embedded therein (“Third-Party Components”). Such Third-Party Components are owned by their respective owners. You acknowledge and agree that the Third-Party Components are a proprietary product of their respective owners and licensors. You further acknowledge and agree that any and all right, title, and interest in and to the Third-Party Components, including associated intellectual property rights, are and shall remain the sole and exclusive property of their respective owners and licensors. This Agreement does not convey to you an interest in or to the Third-Party Components, but only a limited right of use, revocable by the terms of this Agreement. You may not remove or modify any markings or proprietary rights notices that appear on the Third-Party Components. It means that even though Search.seasytowatchtv2.com redirects you to untrustworthy or even malicious web domain filled with potentially dangerous content, the Polarity retreats and the consequences leaver at your fault. Continuous data leakage is yet another reason why we recommend people to remove Search.seasytowatchtv2.com search. As we have already pointed out, it uses tracking cookies and web beacons to collect Search Data. However, experts from NoVirus.uk point out that Search Data is not limited to personally non-identifiable information. By agreeing to use this browser hijacker you agree to disclose your email address, IP address, full name or even telephone number to Polarity and its partners. The good news is that although the app might try to protect itself from elimination with the help of Browser Helper Objects (BHO), the Search.seasytowatchtv2.com removal is an easy task if you do it right. Browser's clearance from this potentially unwanted program (PUP) consists of two parts – uninstallation of unwanted applications from the system and web browser's reset. The first step can be initiated manually by following the instructions provided down below or automatically with the help of Reimage. The second part can only be initiated manually, so don't forget to reset your web browser after wiping off PUPs. Easy to Watch TV and similar web browser extensions developed by Polarity Technologies can hardly be downloaded from the Internet as stand-alone installers. They are distributed as pre-default components of free programs. Therefore, to prevent installing such and similar PUPs, you must to unfurl the freeware package and opt out of its parts. To disclose PUPs, you have to opt for Advanced or Custom installation method and carefully read all the terms. Inspect each installation window and look for promotions advertising “useful” add-ons, toolbars, extensions, etc. Unmark pre-default components before clicking the Next button. Otherwise, each of them will be installed without your consent and initiate all unwanted changes behind your back. If that has already happened, follow the instructions provided below. Search.seasytowatchtv2.com removal is not that complex task as it may appear to be. 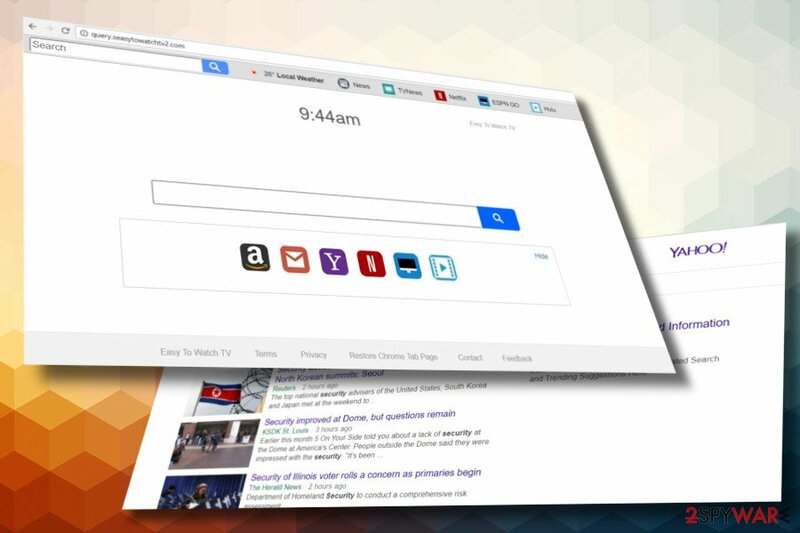 According to people, it reassigns itself as the primary browser's page and search site even after being eliminated. This might happen if you remove Search.seasytowatchtv2.com virus inappropriately. To eradicate this web browser's extension, you have to remove all PUPs from Control Panel and then reset the affected web browser. Here, look for Search.seasytowatchtv2.com or any other recently installed suspicious programs. Wait until you see Applications folder and look for Search.seasytowatchtv2.com or any other suspicious programs on it. Now right click on every of such entries and select Move to Trash. When in the new window, check Delete personal settings and select Reset again to complete Search.seasytowatchtv2.com removal. Once these steps are finished, Search.seasytowatchtv2.com should be removed from your Microsoft Edge browser. Here, select Search.seasytowatchtv2.com and other questionable plugins. Click Remove to delete these entries. Now you will see Reset Firefox to its default state message with Reset Firefox button. Click this button for several times and complete Search.seasytowatchtv2.com removal. Here, select Search.seasytowatchtv2.com and other malicious plugins and select trash icon to delete these entries. Click Reset to confirm this action and complete Search.seasytowatchtv2.com removal. 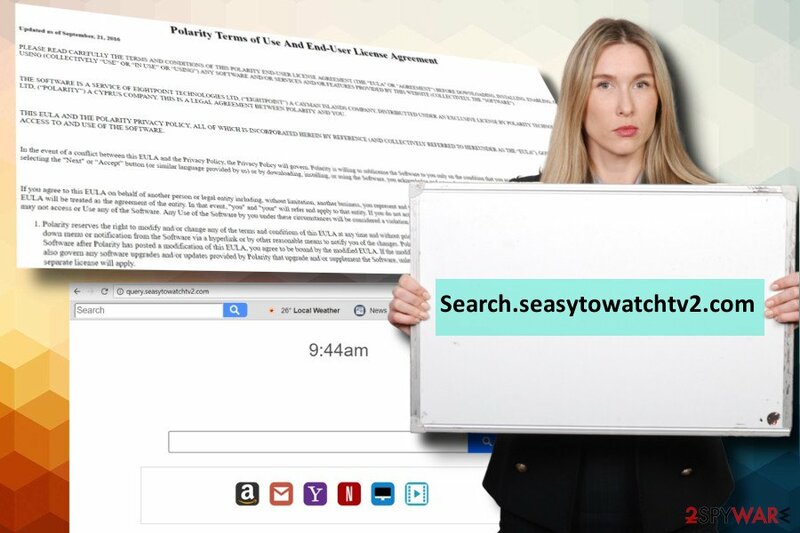 Here, select Extensions and look for Search.seasytowatchtv2.com or other suspicious entries. Click on the Uninstall button to get rid each of them. Here, look at the Homepage field. If it was altered by Search.seasytowatchtv2.com, remove unwanted link and enter the one that you want to use for your searches. Remember to include the "http://" before typing in the address of the page. Now you will see a detailed dialog window filled with reset options. All of those options are usually checked, but you can specify which of them you want to reset. Click the Reset button to complete Search.seasytowatchtv2.com removal process. ^ Browser hijacker. Techopedia. Technology-related news, insights, and inspirations. ^ NoVirus. NoVirus. UK-based cyber security news site. ^ Tony Bradley. What Is A BHO (Browser Helper Object)?. Lifewire. Practical advice on how to live better with technology. This entry was posted on 2018-03-19 at 02:57 and is filed under Stealing programs, Viruses. You can quickly scan the QR code with your mobile device and have Search.seasytowatchtv2.com manual removal instructions right in your pocket. How did you remove Search.seasytowatchtv2.com?